Lee Miller and Bob McHugh, right, salute the fans. Picture: Michael Gillen. 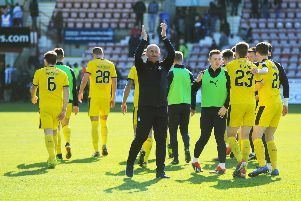 Sunday was a scorcher in sunny Ayrshire, but Kilmarnock extinguished Falkirk’s lead and promotion hopes by keeping a clean sheet. Bob McHugh and his fellow strikers Lee Miller and John Baird couldn’t find the net, but the forward is certain the Bairns can use another disappointment to fuel another hot streak next season. McHugh – fast becoming a cult-hero for the Bairns supporters – has popped up with vital strikes which re-ignited Falkirk’s promotion hopes at Easter Road and Starks Park this term. That has helped the Bairns bounce back from their Scottish Cup disappointment this time last year and McHugh believes the strength shown in the aftermath of Hampden which helped build this season, can be used as more motiviation for the Bairns players next term. Peter Houston has already outlined the need for more quality and physicality which will create more competition for places for McHugh and his team-mates, and provide the lift in expectation for the new season after Sunday’s low. McHugh added: “If you told me the season I’d have had I’d have taken it but going so close, it feels raw and just disappointment. “I had a frustrating first few months but in the second half of the season I’ve found my stride. The next few weeks I’ll need to start focussing on carrying on my decent form into the start of next season so we can hit the ground running. “The idea for coming to Falkirk was playing for a massive club and getting games and creating chances and I was confident I can score goals. It’s been a good end to the season for me but it’s all disappointing at the moment after the game. “I don’t think we did ourselves justice. Everyone in the team can look themselves in the mirror and know we each worked as hard as we could, but as a team I don’t think we played as we can play and that’s the case over both ties. Kilmarnock played the better football over both matches and that is a disappointment. “It was a disappointed dressing room, a very quiet dressing room. The fans were still buzzing despite the disappointment and sang loud to thank the players for their efforts this season, and McHugh – a popular figure in their songs and chants – was very grateful.